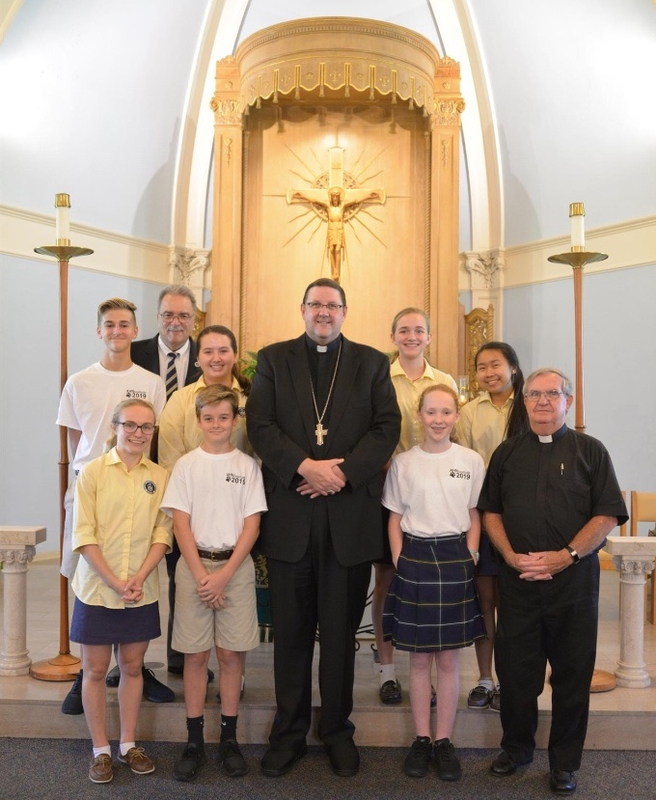 We were pleased to welcome Bishop Gregory Parkes to the Academy to celebrate our opening Mass on the Solemnity of the Assumption yesterday. Bishop Parkes has a very nice way about him. 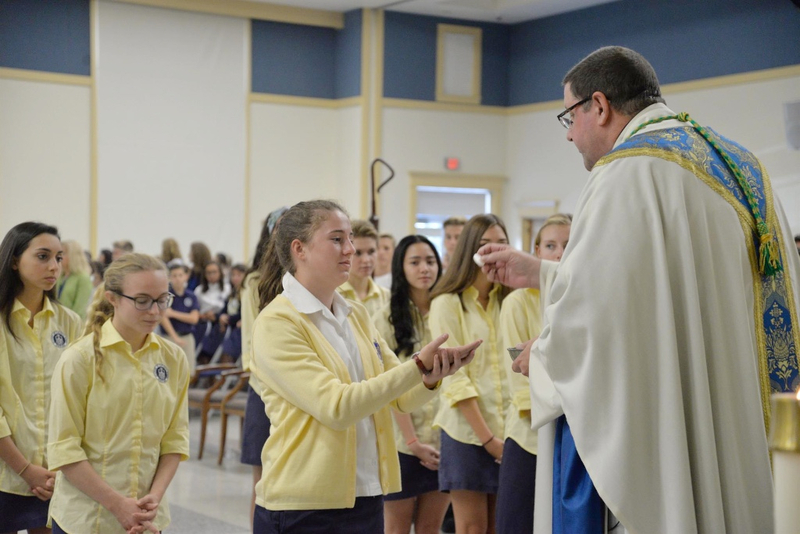 His pastoral approach was evident right from the start, and he really connected with both students and adults. He began his homily by answering the question that he said was probably on everyone's mind--"How tall are you?" He told us he is 6'8". He is a very big man but a gentle giant to be sure. As he continued, he asked our students to do three things during this school year: make a new friend, try something new and be kind. Simple requests that will have a profound effect on the entire community. Though he could not remain for long after Mass due to his busy schedule, he promised to return to tour the school and visit some classes. We are in the process of scheduling it and look forward to sharing more of the Academy with him. Having Bishop Parkes here was certainly the highlight of our day. 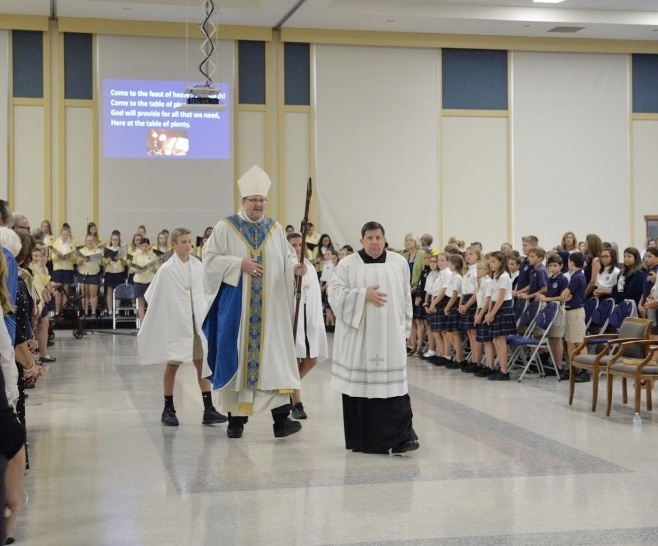 He was amazed that we would have a school-wide Mass on the first day of class, but it turned out beautifully due to the hard work of the Campus Ministry staff and the student singers, altar servers, Eucharistic Ministers, and readers who performed their duties flawlessly. It was a great way to open the school year. I hope your children have enjoyed their first two days of school. Welcome Back AHN! Click Here to View All of Our Back-to-School Photos! This year, each AHN student will receive a backpack tag. Please make sure this tag is filled out and attached to your child(ren)'s school bag. Students with larger athletic bags (e.g. softball bags) should ask for a tag from their division office. This policy has been implemented to ensure permitted bags are easily distinguishable for security staff and faculty. Elementary students will receive their tags tomorrow. Lost & Found Reminder: Please Clearly Label Student Items With First & Last Name. Items With Names Will Be Returned. Unclaimed, Unlabeled Items Left in Lost & Found Are Donated At The End of Each Quarter. Mark Your Calendar: The ES Back-To-School Pool Party is Next Saturday, August 25th from 5:00-7:00 p.m at AHN Pool! Does your child like to sing? Don't miss out on our two choir opportunities! All students in 4th grade are welcome to be members of "Celebrate." The choir will meet each Tuesday during recess beginning on August 21st. Students in grades 5-8 can join "Praise," which will meet on Wednesdays from 8:00-8:40 a.m. in the Chapel. The first practice will be held on August 22nd. All are welcome and there are no auditions. For more information, contact Ms. Linda Ruescher. AHN will be holding a free, optional practice PSAT for sophomores and juniors on Saturday, September 22nd, from 8:30 a.m.-12:00 p.m. Revolution Prep will provide the testing and scoring. Click here to register by Friday, September 14th. Please bring an approved calculator, #2 pencils, water, and a snack. Feel free to contact the College Counseling Office with any questions. The Class of 2019 Senior Parents are invited to a Kick-Off Party on Wednesday, August 22nd from 6:30-8:30 p.m. Join the administration, guidance and fellow senior parents for a fun night celebrating the start of your daughters' senior year and to learn about this year's senior events. Click here for more information. Please RSVP as soon as possible to Beth Reid. 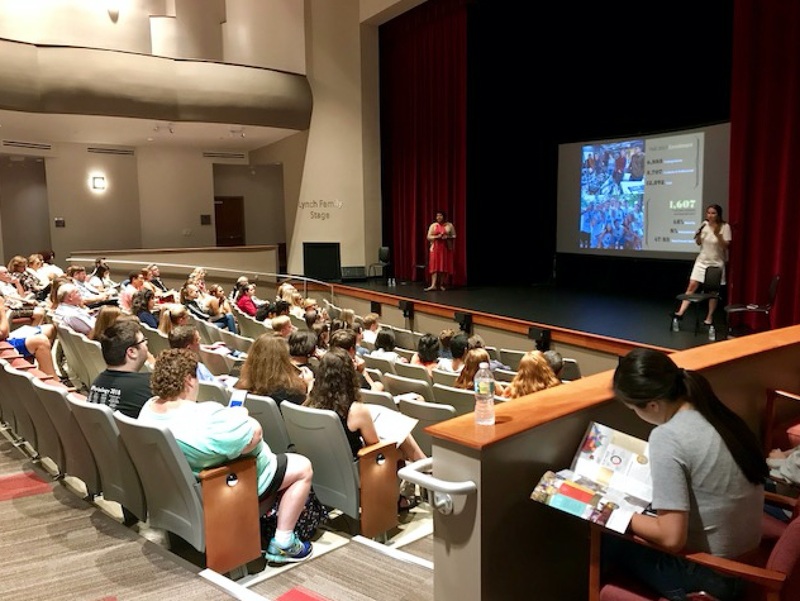 The College Counseling Office hosted an information night for Vanderbilt University. 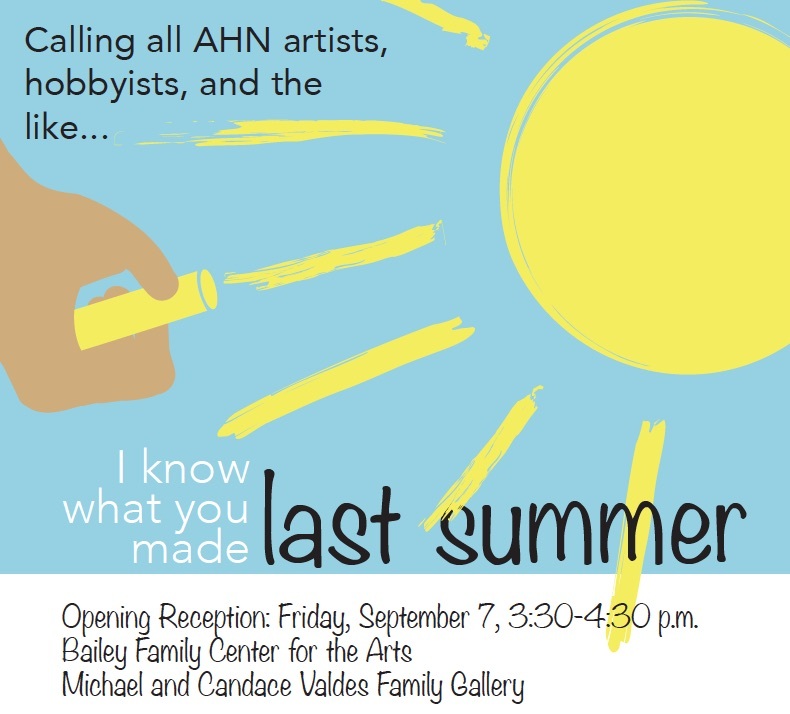 It was their first event in the Bailey Family Center for the Arts and over 100 people were in attendance, both AHN families and those from the surrounding areas! Calling all students! You are invited to join the AHN Theater Department at Jesuit High School on Thursday, August 23rd for an Informative Theatre Program Meeting. The meeting will be held from 4:30-5:15 p.m. in the Multi-Purpose Room. Please contact Mrs. Kimbler with any questions. -LS Back-to-School Night (PK-4th Grade), 6:00 p.m.
-Senior Endowment Kick-Off Party, 6:30-8:30 p.m.